When I mentioned to Pretty Handsome Guy that I was going to give our master bedroom a makeover, he thought I was nuts. I did paint this room when we first moved into our home seven years ago. And I gave it a mini-makeover in 2011. But, it was exciting to be able to repaint and give the room a fresh new look with an ombré wall technique. I framed a few of our travel photos in white frames from Target. The tree branch jewelry holder is another one of my DIY projects. The aqua dresser has so much personality with the new knobs. One of my favorite additions to the room was my DIY Button Pendant light. The hanging light frees up space on the vanity. To display more flowers ;-). I love the contrasting look of the white furniture against the dark gray walls. With a few colorful throw pillows, our bedroom has a soft but vibrant color palette. I owe a huge debt of gratitude to my sister for her interior design assistance when pulling all the colors and fabrics together! The bed was a labor of love, but I was so thrilled to be able to use the wrought iron oak leaves from our old sleigh bed. The added storage drawers make it perfect for storing extra linens. The bed is pure heaven to sleep on! Especially because we were able to create our own separate comfort levels with our Savvy Rest DIY latex mattress. And we can change our layers in the future if our comfort needs change. They all fit into a quilted zippered casing. The mirrored bench at the foot of the bed was from Kirklands, but I ended up returning it because our bedroom felt too crowded with it. What was your favorite piece of the makeover in our bedroom? I honestly can’t pick just one thing. But, if you forced me, it would be a toss up between the bed and the button pendant light. Or maybe the ombré wall and the aqua dresser. Shoot, I told you I couldn’t decide! Thanks for supplying all the info about everything you used! 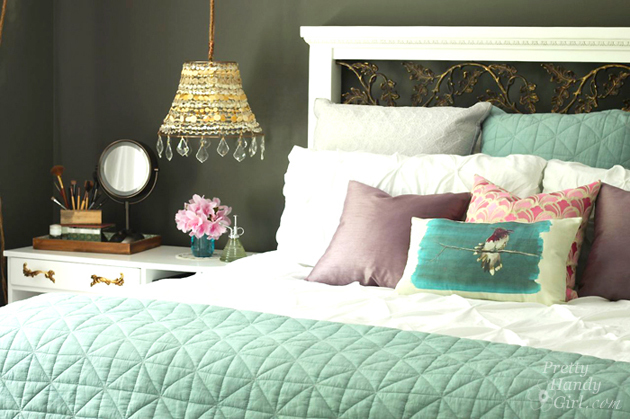 I’m planning to re-do my bedroom this fall….and I’d love to copy the paint color and both bed side lamps!! It looks wonderful, great job Brittany! The best for me is what you did to your bed…extra storage space! That was incredible. A second is the bright blue dresser paint job, outstanding! I love the rug! Looks great – such a fun color scheme! Oooh, the button pendant light and THAT WALL are my favourites. Seriously in love with that wall and I am normally a ‘white, white, everything white’ kind of wall person. I can’t decide what element is my favourite! I love the ombre wall technique, how you reused the wrought iron detail from the other bed frame, the over all colour pallet…well done indeed and thanks so much for sharing! Hands down…the ombre technique is the most magical of all painted walls I’ve ever seen! The rug isn’t too shabby, either! Nice job! Well done! I’m so impressed by how you kept the cost low but truly created a whole new room! How do you like the grey walls now (two months later)? I have been wanting to paint my room grey but have concerns about it feeling cold/industrial (which I always think I like but don’t know if I’m bold enough to implement). I have been thinking about it since I saw your original post. I have that weird angled ceiling (it goes wall, angled ceiling, flat ceiling-does that make sense?). I’ll find a new comforter once the walls are finished! Great ideas! I just moved to a new place and as it’s not too big, I’m currently trying to organize the storage space according to my needs. Under the bed storage is a very good option and I’m definitely including some of your suggestions in my plans. Thank you for sharing!